Tired of downloading each individual image to load into your personal PowerPoint Presentations? The solution is here. At the request of many of our users we have begun to make available the direct download of our images already installed into PowerPoint Presentations. Our first PowerPoint Presentation contains 18 images from the "hometown" of Santa Claus in southern Turkey. To examine the images on our web site Click Here. 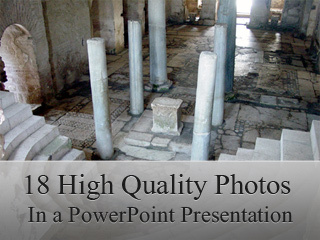 For only $3.00 you can download a PowerPoint Presentation consistiing 18 images directly to your computer. Order from our secure server.